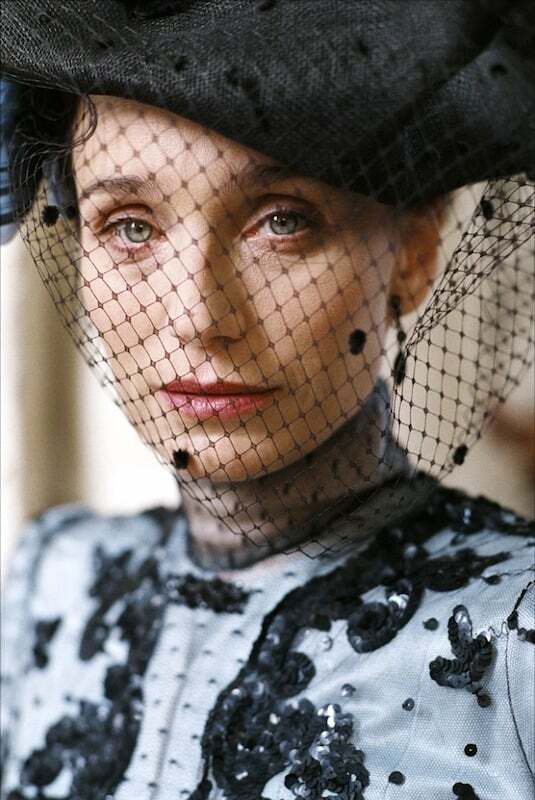 I don’t know if I think of Kristin Scott Thomas as a “costume movie actress,” since the #1 film I associate her with is, of course, Four Weddings and a Funeral. 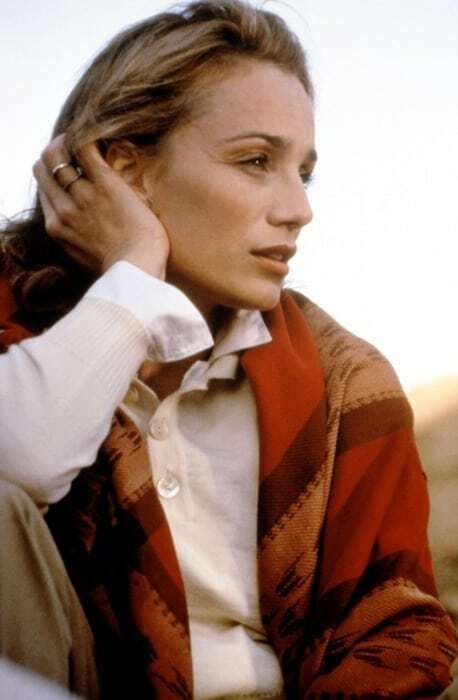 But she’s actually done a number of period films far above and beyond just The English Patient! She’s so stunningly, regally beautiful and so great at inhabiting different characters that I definitely perk up when I see she’s in something, so let’s take a look at all her historical roles. 1930s, London, affairs, based on the novel by Evelyn Waugh. Look kids! Phones used to have cords! 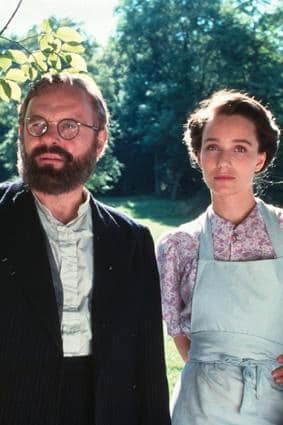 A post-World War II movie with Anthony Hopkins: “After willing his estate to another man’s family in order to save his own life in a Nazi prison, Chavel returns to his erstwhile home in disguise, where he meets Therese, the sister of the man who died in his place” per IMDB. Thomas is fluent in French and actually does a decent amount of French movies! This one is set in a French colony in the 1950s. An Austrian doctor is torn between two women in the 1910s. A TV movie about the writer of the James Bond novels; Thomas plays his fiancée. 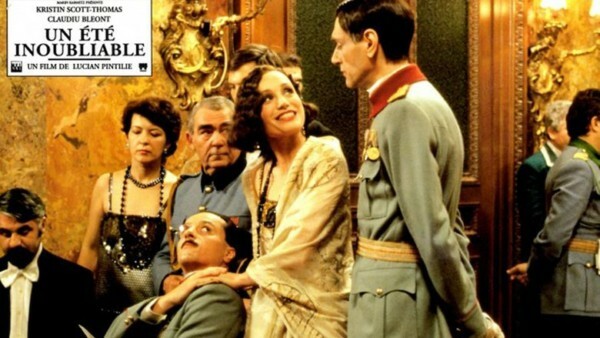 In 1920s Romania, Thomas plays the wife of an army officer; they are sent to a remote outpost after she rebuffs her husband’s commanding officer. Such a weird and wonderful movie. Mark Rylance is a naturalist who marries into a verrrrry interesting Victorian family. 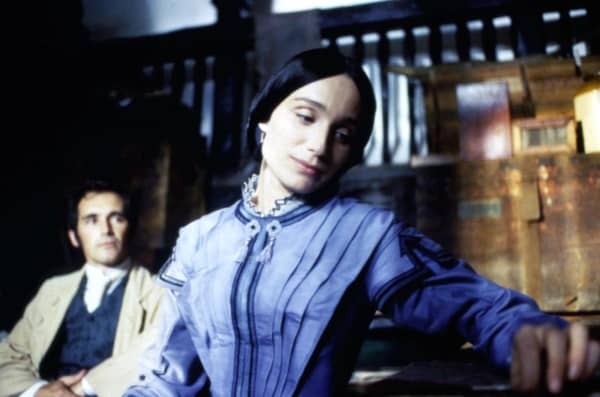 Thomas plays the plain and retiring governess who turns out to be intelligent and far more of a kindred spirit than he initially thinks. Go for the smart one, Mark! Love the sheer black chemisette and that sleeve trim!! (Pronounced “Richard Eye Eye Eye,” of course). A 1930s, fascist-set adaptation of the Shakespeare play. SO GOOD. 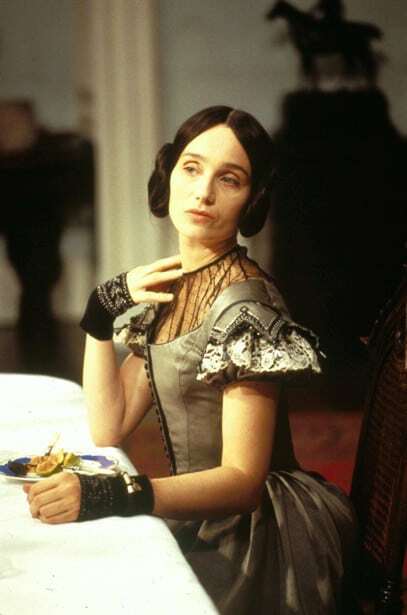 Thomas plays Queen Anne (Neville). World War II, two doomed romances. Thomas plays a married woman who falls in love while in Egypt. Expats in Florence, Italy just before World War II. 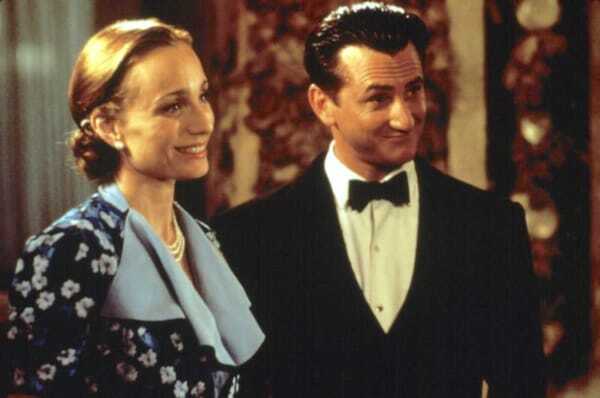 Sean Penn, not a period-film actor. An upper-class house party in 1930s England — but somebody gets murdered. Tons of intertwining stories and naturalistic (in a great way!) dialogue. Thomas is the glamorous wife of the victim. I SO want to see this, as the costume looks AMAZE-BALLS — but I can’t find a subtitled version, and I can never keep up with movie French. The title character is a thief in fin-de-siècle Paris. Here’s a happy one: “An epic about anthropologists who hunt and capture pygmies for study back in Europe, in an attempt to illustrate the link between man and ape” (IMDB). A sparkly adaptation of a 1920s Noel Coward play. The big budget adaptation of Philippa Gregory’s Anne Boleyn novel. 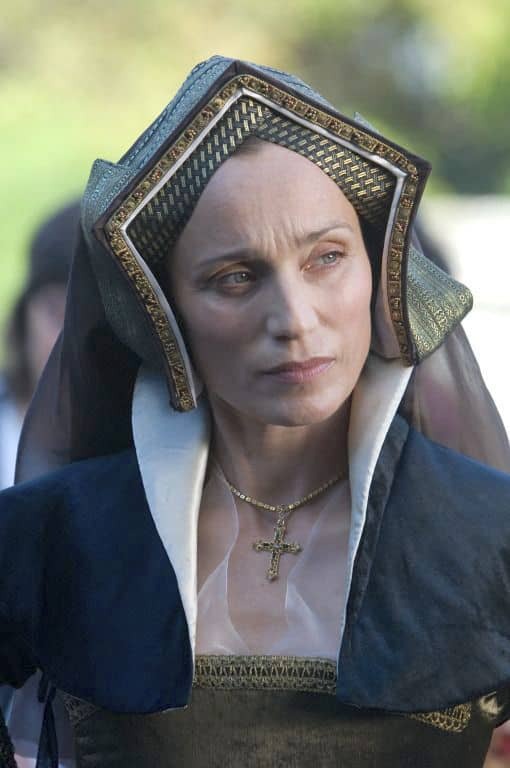 Thomas plays Anne’s (and Mary’s) mother, Elizabeth. She’s mostly background-y until she gets to tell off her husband for essentially selling off his daughters, which is satisfying. 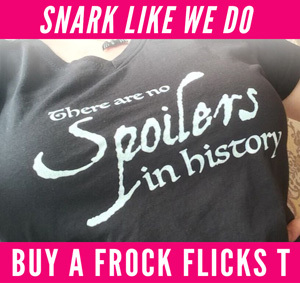 In no way a great a movie, but if you want to see turn-of-the-1890s costumes done spot-on, you couldn’t do better. Charles Dickens’s affair with much-younger actress Ellen Terry. Thomas plays Ellen’s mother. I did see this, and, meh? It wasn’t bad, but it wasn’t good. The mid-Victorian costumes are fine, the story is fine, the acting is fine, but nothing inspires me to be able to say anything else. Hence why I haven’t managed a review! 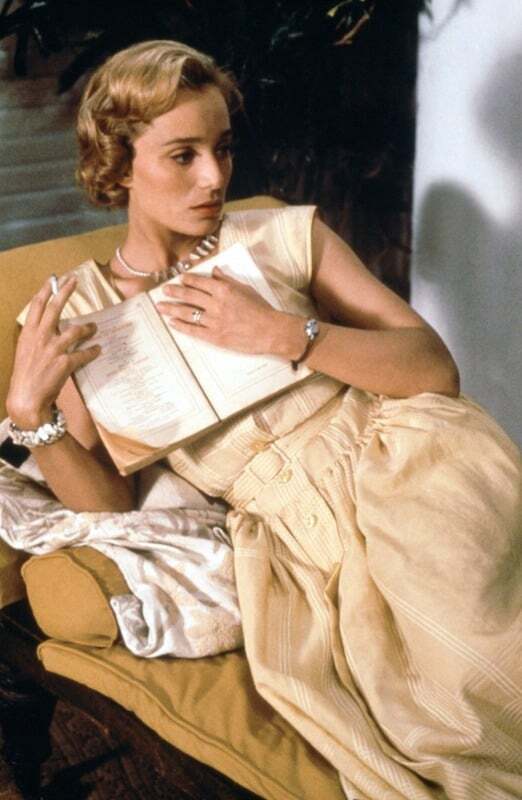 A French woman has an affair with a German soldier during World War II; Thomas plays the woman’s “domineering” mother-in-law. 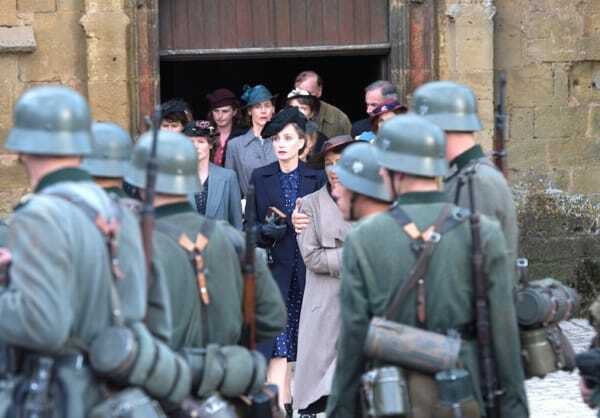 Thomas plays the wife of Winston Churchill as he deals with Hitler and the beginning of World War II. I think she looks stunning with white hair! 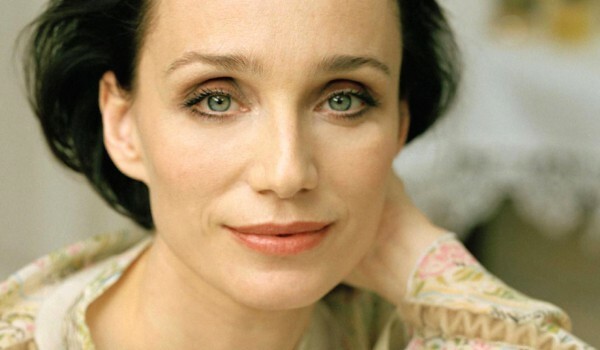 Which is your favorite of Kristin Scott Thomas’ historical roles? 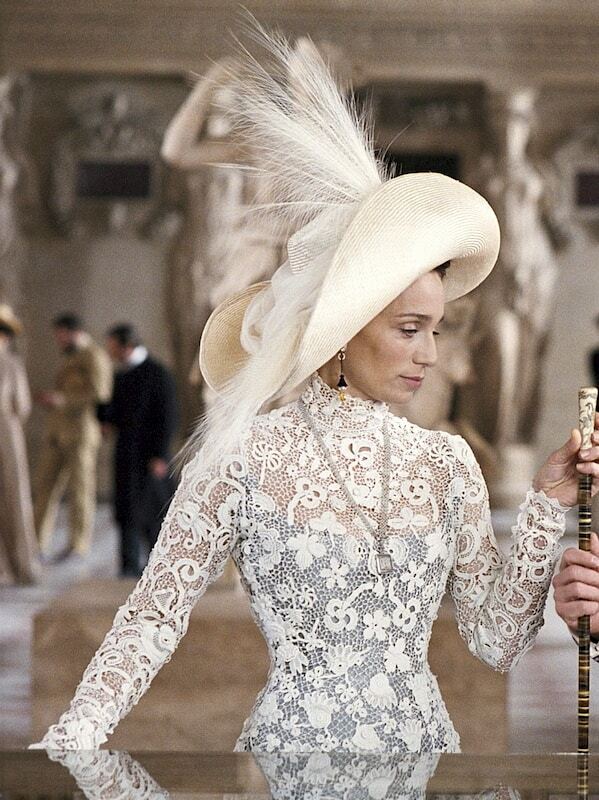 I think the white over-lace-gown is a recyled costume that I first saw in “Lark Rise to Candleford” on the magistrate’s wife — I only suspect this, because every time I see it, I gasp out loud in utter awe at how gorgeous it is. I’ve seen most of these!! 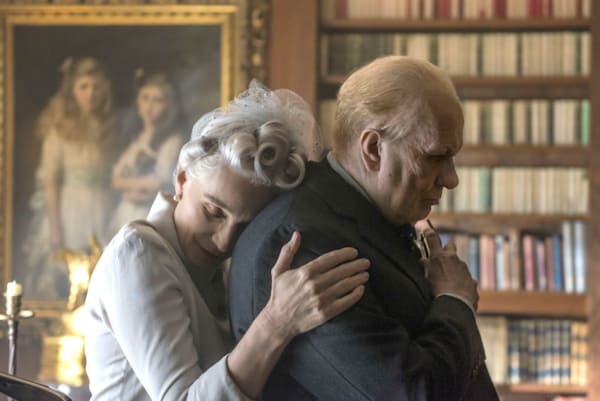 Am very much looking forward to the Churchill film (tho, can he top the terrific performance in The Crown? We shall see!). 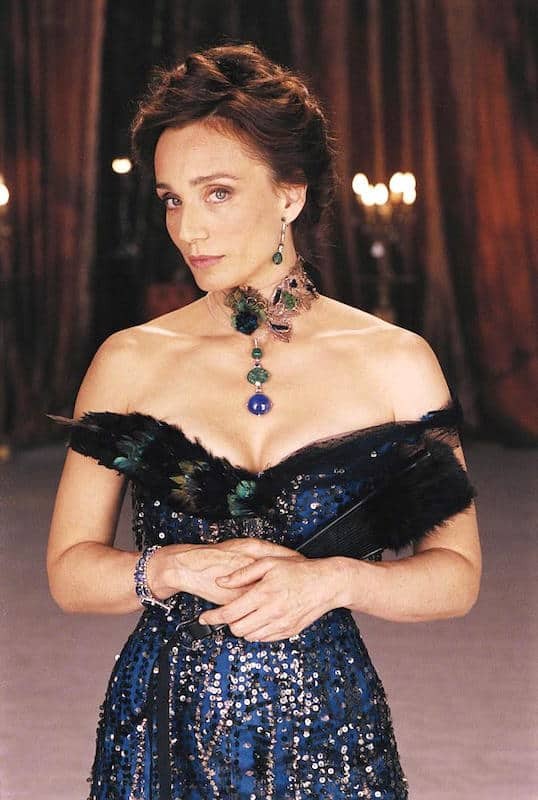 I also disliked her character in English Patient. I did not like the main story. It was the secondary story about the nurse and sapper that was for me the highlight of that film so though I agree she is a fine actor I don’t warm to her. 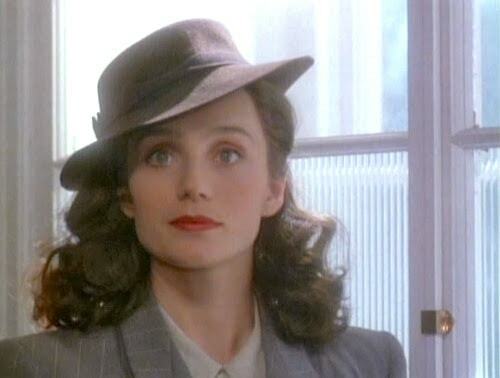 Her character in Angels and Insects also did not really win me over though she should have but again I felt the character lacked warmth. I adore Kristin! I love how she transforms herself in every role but that French film looks good enough to eat! 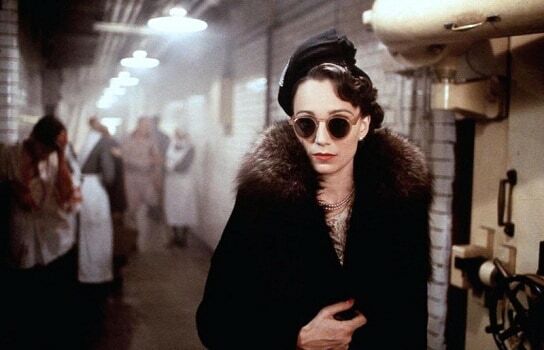 I love Gosford Park so much. I stumbled upon it ages ago when I was home sick and was like, “HOW DID I NOT KNOW ABOUT THIS SOONER.” It is one of my go-to films when I’m feeling like disappearing. KST is only one of the many excellent reasons to watch it. There’s a Canadian DVD (Region 1, English subtitles) of “Arsene Lupin” (2004) available via Amazon though it’s fairly expensive (as of now, $40-plus not including shipping). 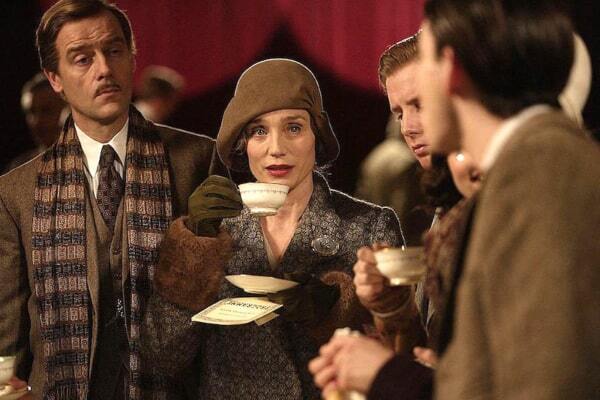 You missed her role in Easy Virtue (2008), based on the Noel Coward play.